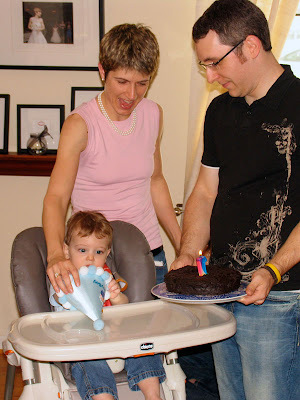 Yesterday, we celebrated Jack's first birthday with a small group of family and close friends. 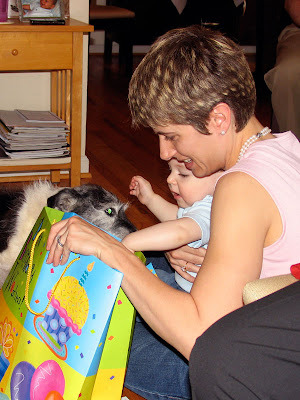 And, true to form, Jack behaved himself magnificently for several hours while people, cake, beer, presents, other kids, and Sparky whirled around him. The only problem going into the party was Jack's apparent egg allergy. A few weeks ago we noticed his bad reaction to egg yolks and our pediatrician recommended we keep the kid off eggs for another whole year. 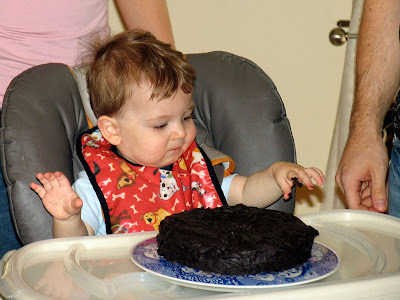 But thankfully Ann and JJ found a recipe for "depression cake," also known as "Whacky Vegan Chocolate Cake." 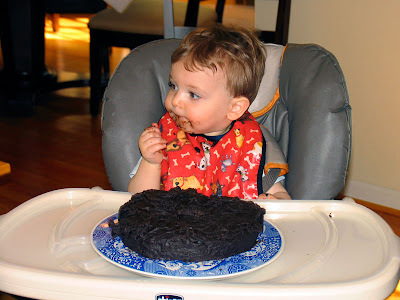 So while the guests enjoyed JJ's fantastic Weary Willy cake, Jack dug into his own delicious egg-free dessert. Sparky got his fair share of both. Ann and I want to thank our family and friends who came to help us celebrate Jack's first birthday. Jack wants to thank you, too, for his mountain of presents! 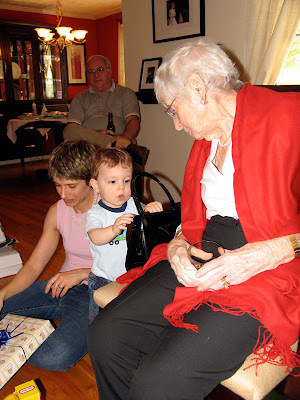 Ann getting the 'lil sir ready for his partay! 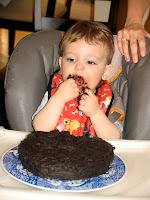 Jack is initially unsure about this "cake"
Jack finally digs in and gets his cake on!